This was wierd to find new plus old next to each other and with such a big difference. 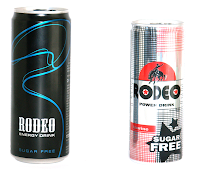 However I am not sure if this is new and old, because both have a different taste, the black can have a less strong Red Bull like taste , more sophisticated and silver one is just plain normal like Red Bull. The black can design is superb but just the info text is bit to big. They should use a smaller font size, cause you see that from the total front you would see the texts on the sides coming up. But for sure the new design is much better and looks less cheap. Actually looks more expensive with the simple design of a rope. However I get the feelin it is bit of a design for female and not strong for male. The blue just made it more softer might be stronger with red. 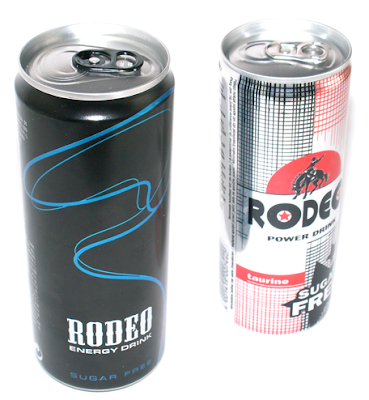 And actually a whole make over even it is changed from power drink to energy drink, and new bigger can instead of 25ml to 33cl. I give a 7 for the design even though it is great looking, but rodeo is more about cowboys and not cowgirls. And the info text cover over the 50% of the side which is too much making it less clean when you look at the can from the frontside.